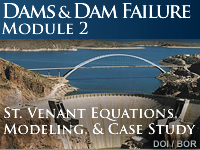 This second module in the two-part series expands on the science explaining catastrophic dam failure and flood-wave prediction methods associated with these events. Through the use of rich illustrations and interactions, this module introduces the St. Venant equations for dynamic wave flow, and flood wave characteristics. It also explains the general dam failure modeling process along with advantages and limitations of dam failure models including model stability, accuracy, and sensitivity issues. Finally, it also provides an overview of the Teton River dam failure, one of the most famous hydrologic events in U.S. history. The two modules that comprise this series are designed to be taken consecutively and together provide a fundamental understanding of this complex hydrologic topic. Yes! I am sharing our department. It's not so easy to pass the quiz of this moudle,there are a lot of knowledge to understand,but it's worth to learn abaout it. more details are required for basic things. This lesson make a good discussion to simplification equations of SVE and introduction to dam failure model. But there maybe a little error in quiz, which is diffuse wave's assumption are steady and either uniform or non-uniform,while quasi-steady dynamic wave are steady and non-uniform flow, so for diffuse wave and quasi-steady dynamic wave, an assumption of steady and non-uniform flow are suitable for both? IT IS A VERY GOOD LESSON FOR INCREASING OUR KNOWLEDGE ABOUT THIS FIELD. 15 March 2016: Answers in two of the quiz questions were modified based on recent feedback from learners.